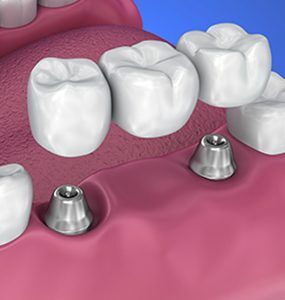 If you require a more extensive restoration than a crown or have more than one tooth that needs to be repaired, a good solution is a bridge. Bridges are usually made of a precious metal base which gives them a solid structure and makes them hard-wearing. If you need a bridge in your smile line, porcelain is usually added to the base to make it look more like real teeth. A bridge helps to strengthen the prepared teeth and makes chewing and eating easier because they are fixed and can’t come out.